The voice of the coyote is one of the distinct sounds of the west. 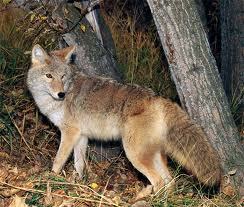 They are most often heard at night as they call out to other coyotes. Once while camping, I heard a most spectacular chorus from coyotes. The first call was only a faint voice calling far to the east along the canyon. After a few seconds another voice responded somewhere not quite so distant. With each response, the calls of the coyotes swept down the canyon like wind. Soon a very clear voice called out only a few hundred yards from where I lay. Their voices gave distance and depth to the canyon in the darkness. In less than a minute, it was over. The coyotes, satisfied that they had spoken to each other, went on about their nightly prowl and remained silent through the rest of the night. Most of my observations of coyotes have been at night. Sometimes I can see them moving about in the darkness but most of the time they are too distant to be seen. Their talk is what a linguist would call a tonal language. It has its own yips, howls, rising notes and frequencies that give it meaning. Perhaps because of their ability to communicate they have remained a very successful species. They are a very social animal and have several variations of calls that communicate different messages. Sometimes their call means “Hello, where are you?” In the spring you may hear a male coyote start a call with a few quick barks which transitions into howl. This means “I am a good looking guy and this is my territory” (called out at the onset of mating season). There is one call that means “Rally the troops, we have an intruder!” Most important however is the group howl. This is when the coyotes gather together and sing their hearts out. It generally starts with one starting off with a slow howl and then others join in with howls and yips and soon many voices overlap with howls and yips as the song goes faster and faster. I can best compare this to a coyote version of a karaoke party. The coyotes of Mount Laguna are very tall and lean. They are the largest I have seen anywhere. They are close to sixty pounds and similar in size to a lean German shepherd. Their coat is rather short and dark. Recently I read that wolves would occasionally cross breed with coyotes. Perhaps they are in-part the decedents of the Mexican Grey Wolfs that also used to live in these mountains. On those nights when the coyotes call, listen to their song because they are saying something.